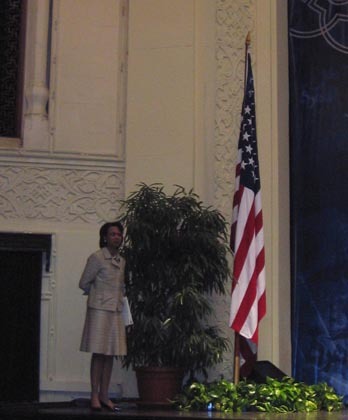 This afternoon US Secretary of State, Condoleezza Rice, gave what the US Embassy in Cairo was touting as a "Major Policy Speech." Rice - who is on a five nation trip to the Middle East - came from Israel, the Palestinian Territories, and Jordan. She spent about 10 hours in Egypt. Reportedly, she met with president Mubarak at 7am in Sharm al-Shaykh before coming to Cairo. At 1pm, she delivered a 30 minute policy speech before conducting Q&A with the audience for 30 minutes before departing to the Sheraton Heliopolis. There, the secretary is scheduled to meet with opposition figures (including al-Ghad's Ayman Nor and Hisham Kassem) and NDP-connected folks (Such as Wafdist Monir Fakhry Abd al-Nor and Mona Zufilqar) before departing for Riyadh around 4pm (Egypt time). Reuters' story is already available for journalist account. More articles will follow tonight and tomorrow. Remarks and excerpts of the speech are available below. Although it was advertised as a major policy speech, there was not a whole lot that was new. Rice was introduced by Al-Ahram Center for Strategic and Political Studies scholar and publisher of al-Dimaqratiya journal, Dr. Hala Mustapha. Mustapha is a member of the Higher Policies Council, which is a 123-person subsidiary of the Gamal Mubarak headed NDP policies secretariat. The symbolism was striking. A young, professional Egyptian woman introduced Rice. The flip side of that symbolism is that she is a card-carrying member of the ruling party. Rice spoke about how the US government had supported dictatorships for 60 years to acquire stability in the region and that policy proved erroneous following 9/11. The policy shift was, then, the adoption of promoting democracy in the region. She said that people in the region were pining for democracy and although it was a long and difficult process, it had begun. She took the audience on a tour of the region discussing people's desire for democracy by sighting the elections in Iraq and Palestine. Insurgents in Iraq, who are attacking people, were described as "evil". 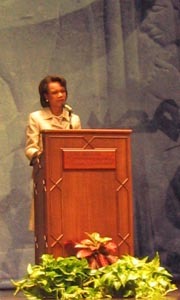 Rice then spoke about how Jordan had began a process of decentralization and reform. She continued to note that municipal elections in Saudi are a beginning there. Syria was singled out as "a police state". Despite Syrians wanting change as she evidenced a recent document signed by 179 democratic activists in Damascus to allow the Damascus spring to (re-) bloom, she called on the Bathist regime to "embrace and trust its people". She also said that Syria needed to get with the regional program of change. After the run-down, she got to Egypt. Rice said the amendment of constitutional article 76 an encouraging step and that it unlocked the door for change. She then said that the US was pressing the Egyptian government to follow through. The ways the government could do this is to allow peaceful protesters (men and women) to express themselves, lift emergency law, and reassert judicial independence. Rice also, in a bit of an escalation, said that Egypt's fall elections for president and parliament should permit equal time for opposition figures to campaign and move about the country. She called for international monitors to be present for both elections and to have unrestricted access. 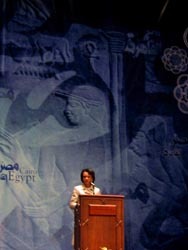 Also, she noted that the Egyptian government must embrace the rule and accept the outcome of the elections. Following this, she got ideological about democracy in a fairly polarizing manner. Rice argued that democracy can never be imposed (only tyranny is). Democracy, she said, had to be a homegrown effort. She rejected claims that democracy leads to chaos by saying that inclusion lifts the fears of difference in a society. She refuted that democracy leads to a decline in social institutions and morals. Then, the speech got into the Greater Middle East Initiative phase as she noted that education and the participation of women are key for introducing democratic development. Then, in a manner that looked less preachy than directly lecturing, she talked about her personal experiences as an African-American woman growing up in the south around the time of the civil rights movement. In the Q&A portion of her appearance, there were several questions from an array of folks. Basically, there were a few journalists who asked about Egypt and the region. A second group of people that spoke about their personal projects and lives and how democracy rocked without a clear question. Then, there were the questions from the front six rows. These were reserved seating for mainly NDP middle-ranking figures. Their questions had nothing to do with Egypt. They, instead, talked about subjects such as Palestine and US-European cooperation towards the Middle East. The secretary was rather long-winded when answering those questions. Basically, the people that talked about themselves and the NDP characters were wasting Q&A time. A few journalists were randomly selected to ask questions (there was no vetting of questions as has been reported with other Rice trips such as the February trip to the Paris high-school). Whether those of us in attendance were vetted or not, I don't know. But I don't think so as I was not asked any questions about my political affinities. One reporter asked her if she spoke to the president about protesters being assaulted and if they were talking with the Muslim Brotherhood. She explained that the US government has spoken to the Egyptian authorities about the "sad" event of protesters being attacked. That was about it on that subject. Rice said that the US government has no contacts with the Brotherhood. She argued that they were engaged with civil society in deference to Egypt's legal framework but that "we have not engaged with the Muslim Brotherhood. And we won't." This seemed to contradict the secretary's portion of the speech which pointed out the democracy means that everyone is included. By using the technicality that she was basing Egyptian law as the policy anchor, this got around the issue of including the MB and its support base in Egypt. Another question got her to say that there is not a plan of action if Egypt's fall elections are not free and fair. Rather, the US government was concentrating on making elections free and fair from now and that they were saying what is expected. She reiterated that the constitutional amendment was a step in the right direction but that it must now be advanced to open the political system. She then said a couple days ago Egyptian FM, Ahmad Abul-Ghait, said that the elections would be free, fair, and transparent. Although she did not say as much, she seemed to take a contented but we will wait and see approach. As she was concluding, Rice drew on her own experience again. She said that people in the US used to say that African-Americans were not ready for or did not want democracy. She said that this was patronizing view in the extreme. A group of friends smirked as this is a frequent refrain spouted by government officials here about Egypt's citizens. I am sure that it was intentional but she did not overtly link it. There were reports this morning that Rice was going to give the Egyptian government a "bloody nose" today, but I am not so sure that was the result. Perhaps this can be a subject of debate in the Arabist's Comments section. Also, there should be more news following her meetings in Heliopolis. No opposition members or movements (read Ayman Nor or Kifaya) were mentioned by her in her speech or responses to questions. Apparently, it is diplomatic nicety not to mention opposition groups or figures when discussing friendly regimes in formal settings. Former US Ambassador to Cairo and current Assistant Secretary of State for Near Eastern Affairs, David Welch, and Elliott Abrams, GW Bush's deputy national security adviser, were some of the top US officials in the audience. And the Opposition not Meeting with Condi? The Kifaya offshoots - the Youth for Change (responsible for the Sayida Zaynib Demo last Wednesday) and Doctors for Change - held an hour long demonstration from 1-2pm at Dar al-Quda al-Uliya on Ramsis Street. The protest had two objectives: 1) To protest Rice's visit and 2) to show solidarity for detainees of the Youth for Change movement. According to those there, about 150 people participated. The central chant of the day was "Idee Mubarak Visa, wa Khudi ma'aki ya Condoleezza." Or for the non-Arabic speakers, "Give Mubarak a Visa and Take him with you Condoleezza."